May 2011 ~ I Can Do That! Sefie and Connie chose Flores de Mayo (May Flowers) for this month's Kulinarya theme. Flores de Mayo is a colorful month-long festival held all over the Philippines honoring the Blessed Virgin Mary, with small girls all dressed in white offering flowers. The highlight at the end of the month is a combination religious and beauty pageant procession [held after attending a novena in church] called Santacruzan (from the words Holy Cross) featuring pretty young ladies dressed in beautiful elaborate gowns, each portraying biblical and historical women such as Veronica, Queen of Sheba, the 3 saints/virtues as queens of Faith, Hope, and Charity, and the last spot in the order of the procession is the queen of all the queens, Reina Elena (Empress Helena of Constantinople who is traditionally credited with finding the one true cross), escorted by a boy portraying her son Constantine. This spectacular religious flower festival is a must-see for anyone visiting the Philippines during the month of May. 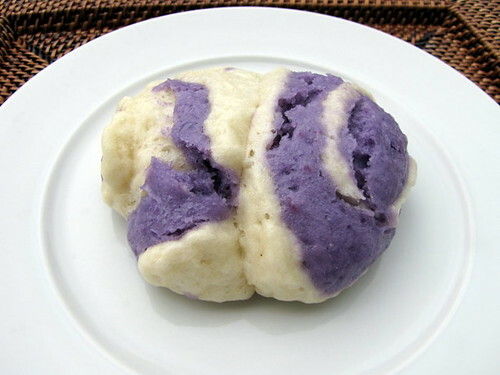 And because I'm an ube (purple yam) fiend, I couldn't resist adding ube jam to a small portion of the dough, layered it on top of another small portion of the dough for a sweet ube pao. 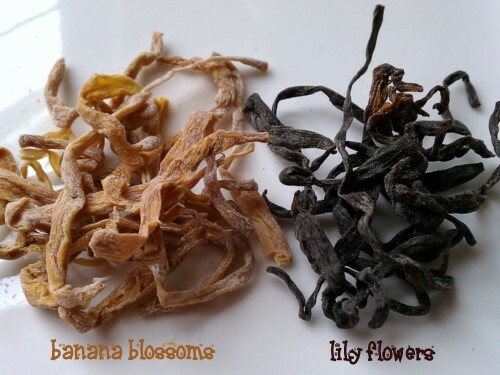 They don't look like a flower at all but they are delicious. Prepare the dough. 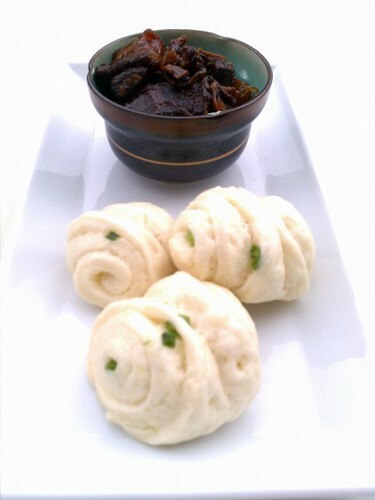 After the first rising, divide into 3 portions. Flatten each portion into a rectangle, about 1/8 inch thick or thinner. Brush all over with oil, sprinkle salt and scallions. Roll from the short end jelly roll style and cut into 1½ inch slices. Press a plastic chopstick in the middle of the sliced dough all the way to the bottom being careful not to sever it; place on a piece of parchment paper. Repeat with the rest of the dough. Cover with plastic wrap and let rise for 45 minutes. Steam over rapidly boiling water for 10 minutes. See more flowery dishes from KCC members here. Psst, check out my "flower" desserts, Apple Carpaccio and Cherry Blossom Friendship Cake, and drink Almond Milk with Rose Essence. A photo courtesy of EricRP of a moderately attired reina, the Queen of Justice. The list of procession participants is here. Santacruzan, originally uploaded by EricRP. I was watching the 1959 black and white movie Our Man In Havana from the director/writer team of Carol Reed and Graham Greene (THE THIRD MAN and FALLEN IDOL) and "the man in Havana", played by Alec Guinness always has a Daiquiri, the popular drink made with lime juice, a little sugar, and rum. 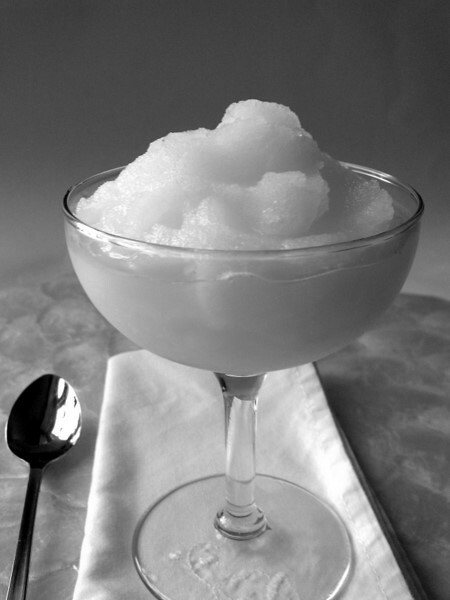 I made mine with dayap (Key limes) and more sugar into a Daiquiri slushy using a blender. It's watered down because of the ice but that's how I like it, sweet and tart with a little bit of alcohol. BTW, the proper pronunciation is "die-kee-ree," not "dack-uh-ree". Blend on high until slushy. Pour into a glass and enjoy. I'm happy I got a goose egg, not a zero but a real goose egg. I bought a few pieces along with duck eggs directly from the farm where the birds are being raised. I would have bought a turkey egg but they ran out. Maybe next time when I go back there which is not too far from my house, about 20 miles, but driving there was a bit dizzying. From the main highway I had to drive on a narrow 2-lane loooong and winding road which I thought at first is endless. There are a lot of farms in the area with livestock, fruits, and vegetables. 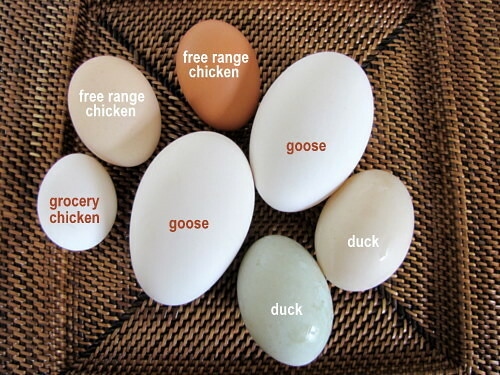 Some of them sell in the farmer's market near my house but the family who sells duck and goose eggs doesn't want to pay the annual fee for a space in the farmer's market. So if I want more duck/goose eggs I will have to drive there again. Goose eggs are huge. 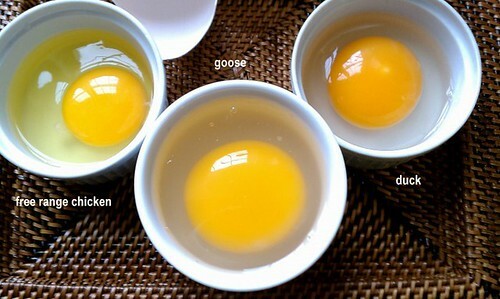 One egg is equivalent to 4 large chicken eggs. The white is translucent and much thicker too. I cooked one with half a tablespoon of butter very slowly on low heat while stirring constantly. 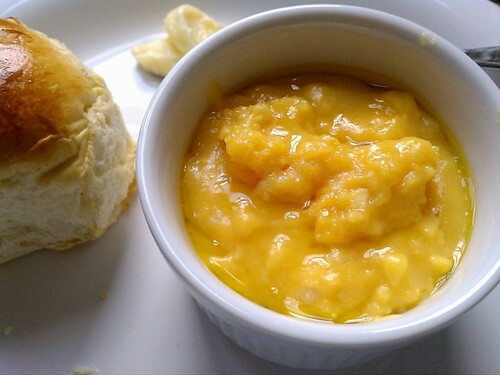 The result is a creamy and moist omelet with almost like yema (egg yolk) candy consistency. The flavor is rich and not as eggy. 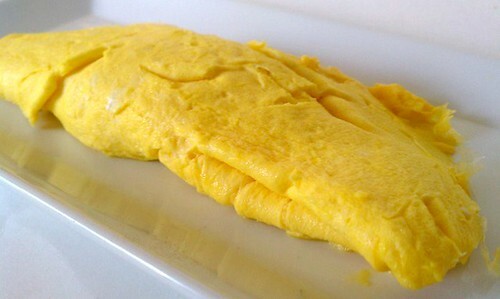 I also made a fluffy omelet with one each of duck, goose, and chicken; that's equivalent to a 7-egg omelet. I don't have the patience to poke one small hole and a pin-size hole on two ends of the goose egg shell and also I can't draw or paint that well so I put one of my photos on an Easter egg design on the Dumpr website where you do all sorts of things to your photos, like distorting your face or make them look like old photos. Try it, it's fun. A reader asked if I will soon be baking a Filipino cheese bread that doesn't have any cheese in it and I said I've never heard of this bread. But I have come across the phrase "no cheese in the dough" and mistakenly looked for it in one of my Spanish cookbooks, but later found it in FLAVORS OF PORTUGAL by Tania Gomes. 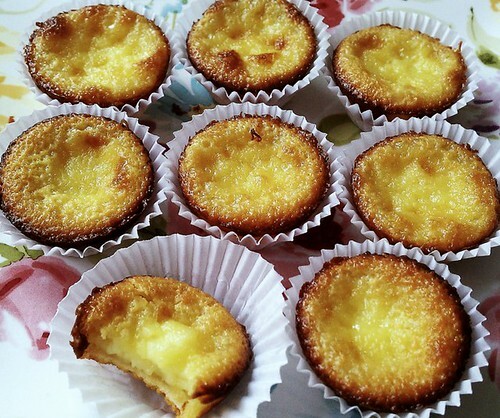 The custard tartlets are called queijadas (cheese tarts) but they don't contain any cheese. 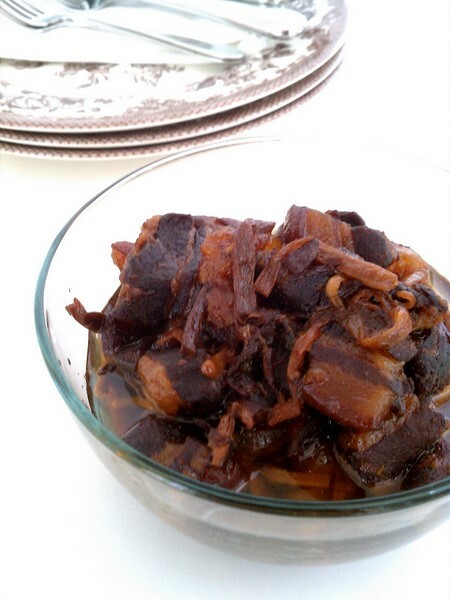 The recipe is short and simple with very few ingredients. 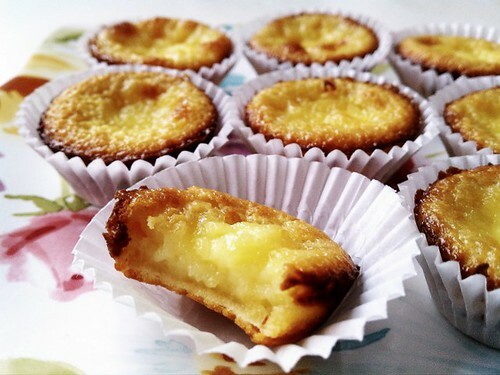 The tarts have a creamy consistency and very satisfying as a dessert or snack. 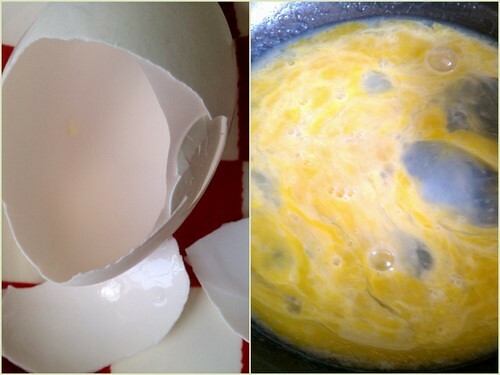 In a large bowl, beat eggs and sugar together until very light and lemon colored. Whisk together flour and baking powder and blend into the egg mixture. Stir in vanilla extract and milk. Fill muffin cups 2/3 full. Bake for 20 minutes or until golden brown. Remove from pan and let cool on a wire rack. Store/serve on paper muffin liners. 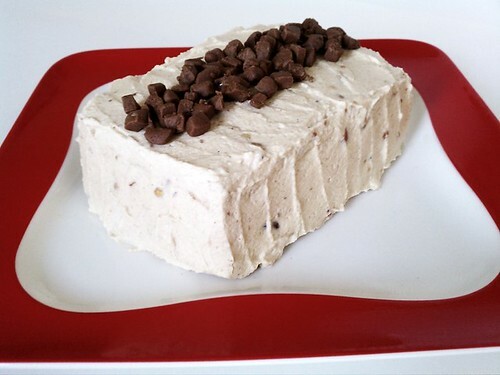 This semi-frozen sans rival has tons of peanuts and a little chocolate, peanut lovers will surely love it. 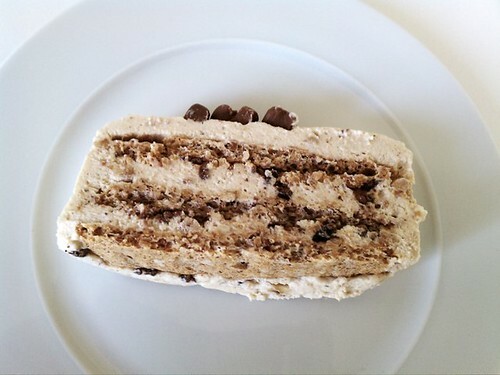 I made the peanut meringue layers thicker than the regular sans rival but crunchy, the filling/frosting has peanut butter buttercream then sprinkled with a little chopped semi-sweet chocolate, and the top is garnished with chopped Choc*Nut. 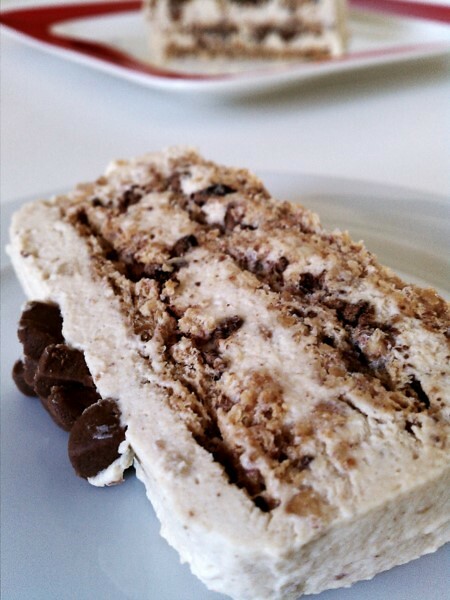 Sooo delicious and peanut-y. Sans Rival recipe is here. 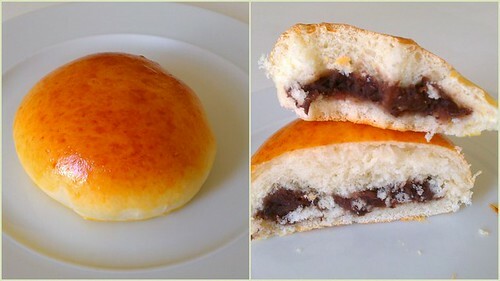 I love the smoky flavor of sweet red bean paste and regularly buy the canned Japanese ones but lately I find them overly sweet. I decided to make the paste from scratch mainly to reduce the sugar content. 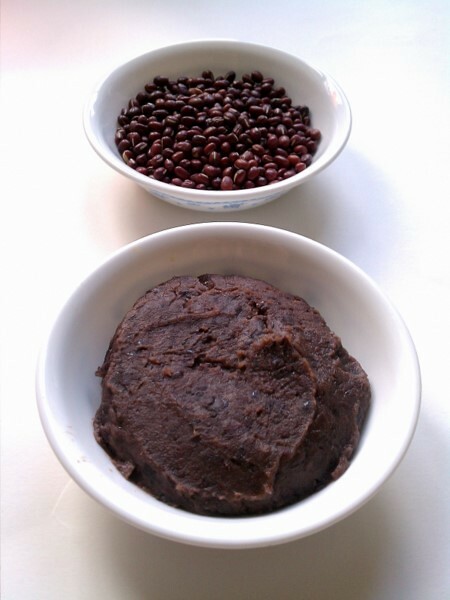 It's not a very difficult process and 2 cups of dried beans make a large batch of sweet paste, about 5 cups, that can fill a lot of pao (steamed buns), baked buns, and hopiang hapon (Japanese-style Filipino-Chinese cakes). 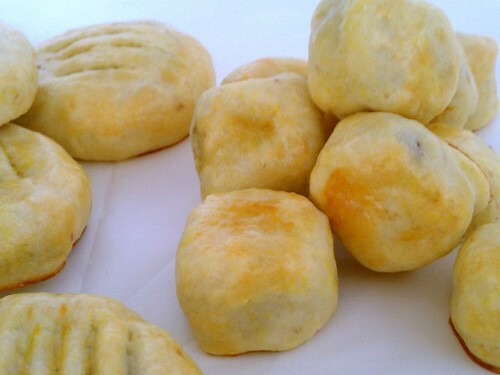 I've made the super flaky Filipino Chinese hopia which is a tad complicated and thought making hopiang hapon would be easier because the dough I remember was not as flaky and greasy as the regular hopia, probably closer to moon cake dough. There aren't many recipes for Filipino hopiang hapon and I adapted the dough from the only one I could find. I underbaked the hopia and they came out pale; and although they don't look like the ones from the Philippines, they taste almost identical. The dough is soft and not sweet at all and I can't stop eating them, they're that good. 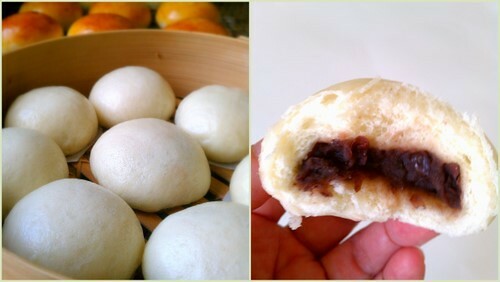 I'll use a moon cake dough recipe next time I make these. Clean, rinse, and soak beans overnight in 4 cups water. The next day, drain beans and place in a large non-stick sauce pan; add fresh water to cover and cook over medium heat until tender. Drain, add sugar and oil, and cook over medium-low heat, stirring often until soft and mixture appears dry. For coarse consistency, mash with a potato masher or blend in a blender if fine consistency is preferred. 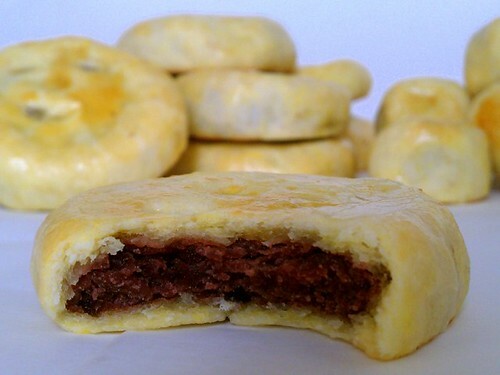 The paste should hold its shape but still moist. Let cool to room temperature, transfer into a container, wrap tightly with plastic wrap and refrigerate until needed. 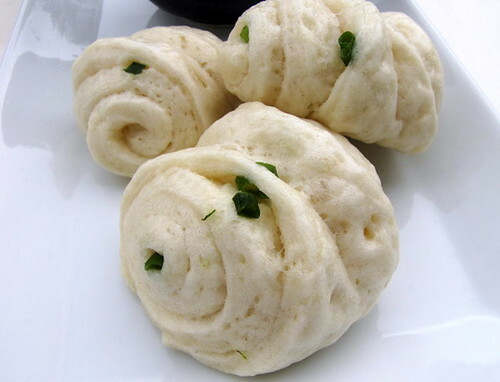 The recipe for steamed pao dough is here. Whisk together flour, sugar, and salt. Cut in cold butter with fingertips. Stir in the rest of the ingredients until combined. Knead lightly just until a smooth dough is formed. Divide into 2 equal pieces and form into logs. Refrigerate for 1 hour. Slice each log into 8 pieces. Flatten each piece into 1/8 inch thick circles. Place a disk on the center and gather the edges. Pinch together and place on a sheet pan, seam side down. 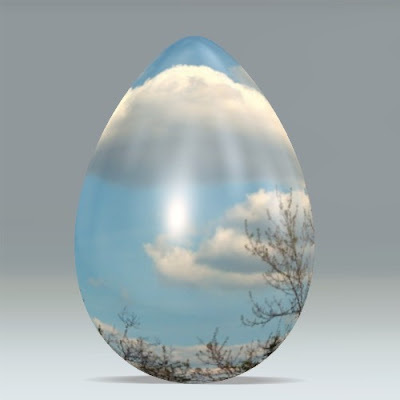 Brush with egg wash and bake in a preheated 375°F oven until golden.